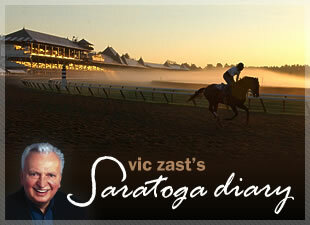 Jack Etzler waited 85 years to make his first visit to Saratoga. The dapper senior citizen spent the morning on the backside Thursday after a long day of wagering, imbibing at Siro's and dining at the Olde Bryan Inn. Despite an early wake-up call, Etzler seemed spry as a two-year-old colt. There's no telling if he'll feel that way tonight on the flight back to Chicago and the drive south from O'Hare to Salem, Indiana. Time will tell. Etzler, the father of a horse owner in one of Jack Smith's partnerships, has been to Keeneland and Churchill Downs often. But what impressed him most about Saratoga was its picturesque ambience and the way families gather for picnics. He found time to try the natural springs water, saying that its taste was the same taste of the water in a resort town named French Lick near his home. In its heyday, French Lick drew stars such as Jack Benny, Bing Crosby and other show business greats as well as gangsters Al Capone and Meyer Lansky, who came to gamble at the Piping Rock and Riley's Lake House on Saratoga Lake. Many horse racing fans used to stop in French Lick on the way to Louisville for the Run for the Roses. On the other hand, Saratoga, with all its features and pleasantries, is its own destination - at least that's how Etzler, at last, saw it. Bet-happy horseplayers were ga-ga over the $209,378 Pick Six Carryover.. Their enthusiasm was tempered almost immediately, however, as Dattt Echo at 21-1 led things off in the fifth and then, after a brief return to normalcy, the 43-1 Crossfirehurricane won the seventh. Crossfirehurricane, owned and trained by Ronnie Werner, triggered a 7-2-3-1 superfecta that paid $111,310. For Friday, the Pick Six will be $656,442. Another longshot won the featured Riskaverse Stakes, the fourth of the six Pick Six races. Silver Reunion, with leading rider Ramon Dominguez, paid $48.00. Dominguez shot the Harlan's Holiday filly to the lead and never looked back. It was the winner's first attempt at turf and she sure did take a liking to it. As usual, Thursday was a steeplechase race day. Danielle Hodsdon, all smiles coming back to the winner's circle aboard an extremely lathered-up mount, won again - this time with the 10-1 Terpsichorean. Peggy Steinman, the First Lady of Saratoga Jump Racing, presented the trophy to the winning connections. The race was named after the late Paul R. Fout, Steinman's devoted and go-to trainer. Rachel Alexandra schooled in the paddock between the fourth and the fifth races. Nearly 700 curiosity seekers jammed the walking ring to see the filly walk and gawk. She took a big, wide circuitous route around the grounds and then stood in the distant saddling enclosure, where undoubtedly, away from the gaze of the fans, she'll dress for her part in the Woodward. NYRA should (and can) do something about making this important horse racing ritual less secretive.